Those looking to buy a finca, an apartment or a villa on Mallorca are hoping to fulfil a dream. Finding the ideal Mallorcan property is not an easy task despite an intensive search. Sometimes dreams and reality are poles apart. Sometimes the location is not right, other times the orientation of the house, sometimes it’s too small, sometimes too big, others have too many steps and stairs and lastly are those that have too much renovation work to be carried out. And almost always the price of the hoped-for bargain deviates significantly from the current market price. The employees of Minkner & Partner show properties that are as close as possible to the wishes of those interested, but unfortunately the search for “unicorns” rarely leads to success. In this situation, the considerations of those interested often turn to building their own dream home. Better a “tailor-made house,” as a “house off the rack”. Of course, firstly you must find a suitable building plot – see “Buying land in Mallorca”. Next is the search for a suitable architect who can plan the house of your dreams, your own finca on Mallorca, and it is best to hold non-binding preliminary discussions with at least two architects. The collaboration will usually take 1½ to 2 years. It follows that you have to find a partner with whom you have “chemistry” who speaks your language and who understands you – after all, you want to live in the house the architect designed, not move in with him. The architect will first carry out an analysis of the plot, examine the public-law criteria of the planned development and determine whether there are any legal or other obstacles to the specific development. Then the architect will determine with you the “space requirements”, your ideas about technology and equipment and then draw up a draft of the plans. Many discussions will follow until the final plan is established. Incidentally, the cost of the architect is approximately 12% of the construction cost. The architect will then apply for the building permit for you – this can take a few months (depending on the workload of the relevant town hall). The next task is the choice of construction company and the technical architect. It is usually advisable to follow the suggestions of the architect and to select those partners with whom the architect has long been able to work together in a trusting manner and who can present examples of properties. The corresponding tenders are also carried out and supervised by the architect. All this involves extensive and time-consuming paperwork completed in several stages: preliminary building application (projecto basico), building permit (licencia de obras) and project execution (projecto de ejecución). It is often recommended to consult a specialised lawyer for all the necessary agreements with the architect, the technical architect and the construction company. Once the construction is completed, the architect will issue a final de obra confirming that the new building was completed in accordance with the approved design. Then follows the final acceptance of the new building by the relevant town hall – also called final de obra. 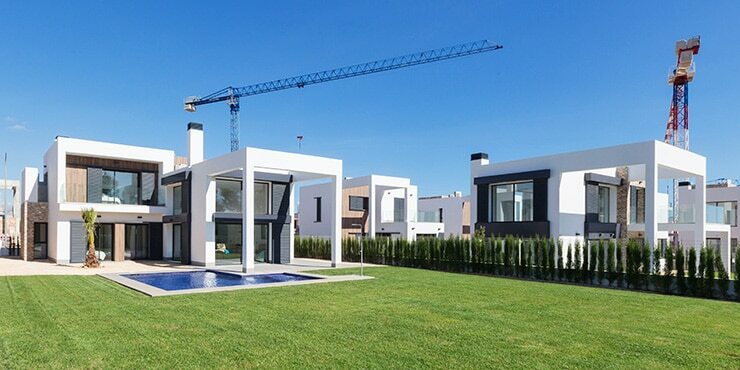 Finally, a notarial act with the so-called new build declaration (obra nueva) is prepared, in which the newly built house is described in detail and then entered in the land register (where so far only a building plot is registered). Incidentally, it does not matter in the case of the described procedure whether the new building is a villa in Mallorca or a finca or a development project. We often hear that prospective buyers are afraid to build on Mallorca: a foreign country, unknown legislation, foreign language, not on site to be able to control things and so on, and so on. We can reassure you. Many of our clients have built their own property on Mallorca and are living there very happily today, as well as having saved a lot of money (namely, the builders profit). However, if you do not live permanently on Mallorca, have not mastered the language and do not already have previous knowledge of building, building on Mallorca will only come to a good end, if you look for trustworthy partners (architect, lawyer, construction company), who will reliably supervise your Mallorca project from beginning to end. Minkner & Partner, real estate agent Mallorca can give you the best recommendations from its network.